GNQ’s prices are based upon the per-square-inch (psi) size of the individual quilt. 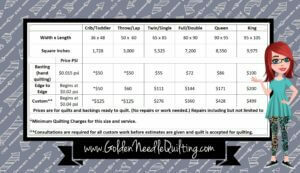 The chart below lists the psi amount and average quilting cost of various types of quilting in the sizes noted. There is additional information below the chart. If you have any questions please click here and for estimate please click here. The Contact form and Quilt Estimate can also be found on the Main Menu. Begins at $0.015 psi with a $50 minimum charge per quilt top. Edge-to-Edge quilting is done from side to side, top to bottom, over the entire quilt top without regard to the piecing or appliqued design on the quilt top. GNQ has a wide variety of edge to edge designs available to choose from or if you prefer GNQ can have a custom edge-to-edge pattern made for you. Custom edge to edge designs are an additional $20 on top of the psi amount and may require a longer turn around time. Please contact Kimberly for more information. 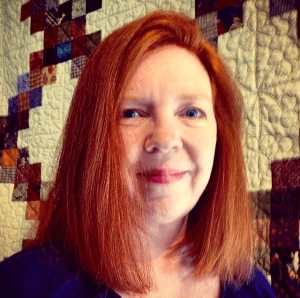 Add separate border treatment for a more customized quilting option. Please contact Kimberly for an estimate and be sure to mention the separate border work in the comments section.. Custom work is limited and accepted on a quilt by quilt basis. Begins at $0.04 psi with a $125 minimum per quilt top. Custom quilting uses separate yet complimentary patterns in blocks, sashing and borders, placing each pattern separately. Custom quilting varies greatly dependent upon design choices and quality of construction of your quilt top. We honor all estimates that are given with the quilts in house. Any quotes via email or phone call are not considered firm quotes until the quilt is in house and I have had the opportunity to look over the quilt.